Sets the default APR for all new finance (Outside Finance or Buy Here Pay Here) deals. Can be customized as needed within the deal. Sets the default frequency of payments for all new finance (Outside Finance or Buy Here Pay Here) deals. Can be customized as needed within the deal. Sets default for entering number of payments or payment amount on new finance deals. Allows entry of a larger one time payment to be included on outside finance deals. Displays interest options for Buy Here Pay Here Deals. They are always visible for Outside Finance deals. Allows you to enter default amounts for government fees, document prep fees, and service contract amounts. If Frazer is aware of specific government fees in your state you may see a button which will allow you to set default values for each fee. These can be customized on each new sale as needed. You will also see any alternate phrases for document prep fees that Frazer knows to be acceptable in your state. You will have the option to include the document prep fee in advertised prices which may be required in your state. You can also determine if tax should be charged on the document prep fee or service contract. Check here if you will be selling Life and Disability Insurance: Allows you to add charges for life and disability products you sell with finance deals. Checking it will display a new checkbox that will allow you to have the frazer software pull from Miscellaneous >> 2- Life and Disability Rates or from preset insurance rates when they are included on a sale. Allows you to enter a standard cost for the dealership when you sell service contracts, life and disability insurance, or any optional product with the sale. Allows you to pre-fill the price of a vehicle you are selling from values that you previously entered on the sales tab of the vehicle file. If you have previously entered a required down payment in the inventory file, checking this option will load it into any sale the vehicle is added to. Checking this option will remind you to determine if a customer has active duty military rights if certain products are included on the deal. Selecting this will pre-fill the mileage entered when the vehicle was entered into inventory. 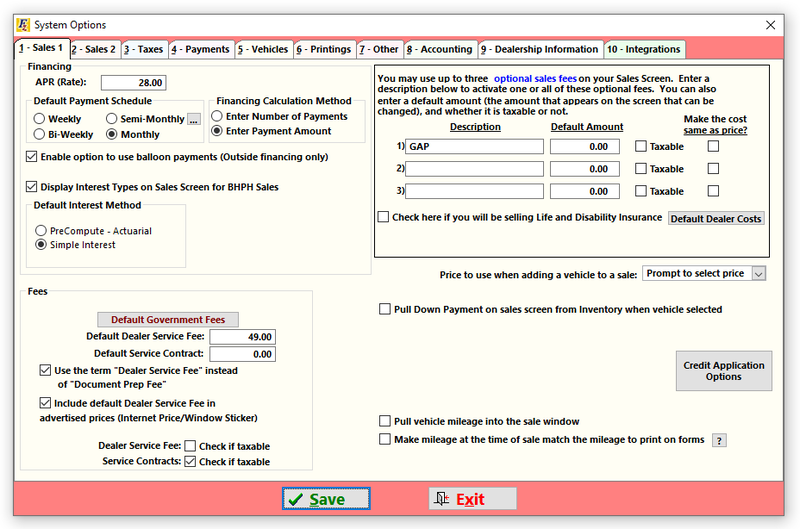 Selecting this option will ensure that the mileage to print on the forms will match the mileage at the time of sale, unless the mileage to print on forms is set to EXEMPT.